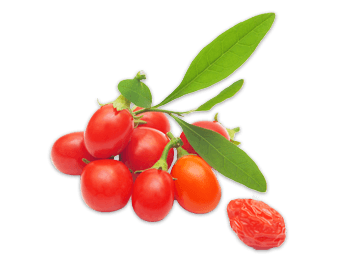 The Goji berry has been used in Traditional Chinese Medicine for thousands of years. These beautiful red berries contain nineteen amino acids including all nine essential amino acids essential for optimal body function: Histidine, Isoleucine, Leucine, Lysine, Methionine, Phenylalanine, Threonine, Tryptophan and Valine. In addition to having complex B-vitamins, Goji has higher levels of Vitamin C than oranges and more protein than whole wheat. Goji contains 21 trace minerals, including germanium, a trace mineral rarely found in foods. Goji also contains Beta-Sitosterol, an anti-inflammatory agent. Goji berries are among the richest sources of carotenoids of all known foods. It has a complete spectrum of antioxidant carotenoids, including beta-carotene (a better source than even carrots) and zeaxanthin (promotes eye health).